This article will be updated throughout the off-season and contains valuable information pertaining to NFL defensive schemes and coaching changes for the 2016 Season. 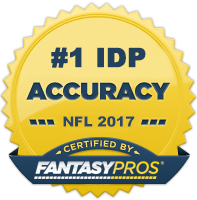 When selecting an IDP, it is important to not only know what position they play, but also the defensive scheme they play in as well. For example, outside linebackers in 3-4 schemes generally produce higher sack totals/lower tackle totals than outside linebackers that play in 4-3 schemes. Cornerbacks that play on defenses that incorporate a lot of Cover 2/Tampa 2 looks typically generate above average tackle numbers relative to their position. For a more in-depth analysis on NFL Defensive Schemes in particular, click here. *Most 3-4 teams are mainly using a 1-gap system, although there are still a few teams using a 2-gap system. Anything in RED is a change from the 2015 season.